Sometimes I get to play in the coolest places! Yesterday I was able to indulge myself both as a photographer and a member of Cycropia Aerial Dance troupe. The troupe was hired to perform at a corporate party of a large insurance corporation, and it was quite clear they had an ample budget. 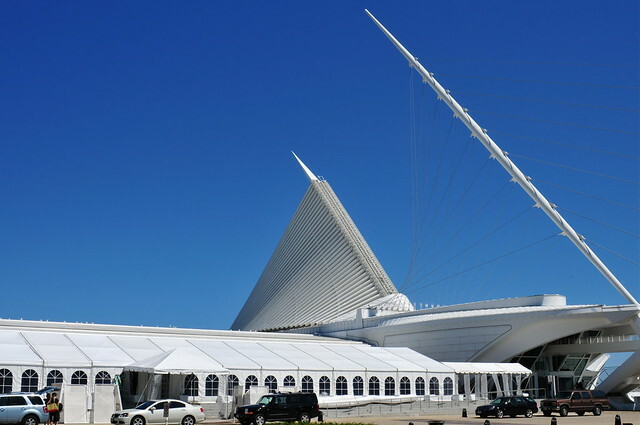 The venue was none other than the Milwaukee Art Museum, located on the shore of Lake Michigan. While I did not have time to prowl the grounds, I was able to take a few good external pics. The tent in the foreground was part of the venue for the event and is normally not there. There were at least four huge air conditioners running through 15" flexible hose to cool the tent in the 87 degree (F) heat. Part of our performance was in the main hall where dinner was served. That meant that we got to play on some of the most expensive playground equipment ever! 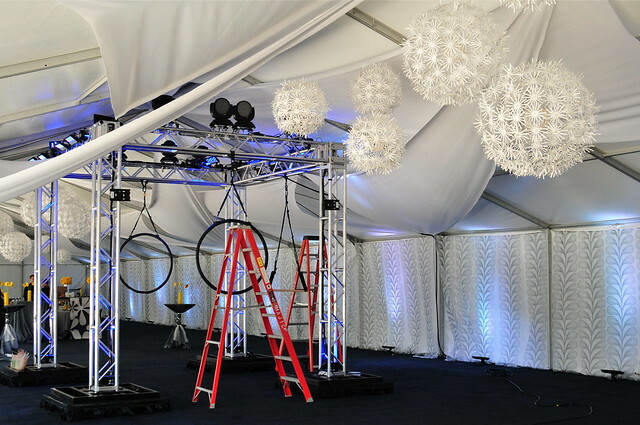 The main portion of our performance was in the tent which was used for the initial meet-and-greet and while the guests were dining it was converted into a lounge. Amazing, really. To hang our aerial apparatus we had a 10-11 foot high freestanding superstructure. We hung two lyra (basically steel hula hoops) and a low single-point trapeze. Our first stint was to provide stately eye candy. The final part, after dinner, was to jump start the dance party. We had a ball. It was an intense physical workout. I cannot speak for the others, but I am quite aware this morning that I used my body hard last night! We seemed to wow the crowd, and more than one person asked if we were Cirque du Soleil (which felt pretty good). 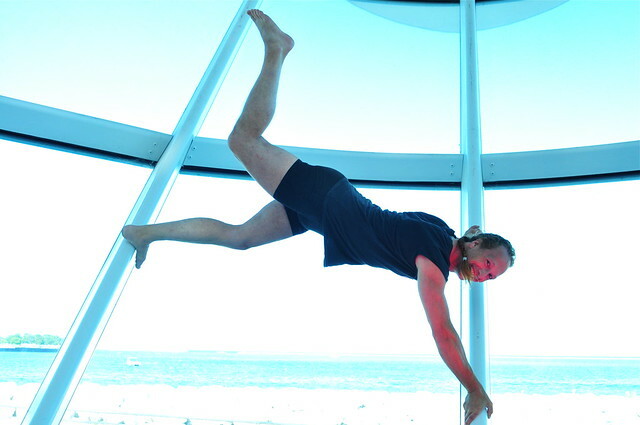 There are more great photos in a SLIDE SHOW for your viewing pleasure. The next performance for Cycropia is the Orton Park Festival. Our show is an amazing outdoor performance with our various apparatus hung in the sprawling branches of a venerable oak tree. Seeing the troupe perform there in 2005 made my jaw drop, and I set my goal then and there that I was going to fly with them. I suggest you catch it if you can.